Rabbit body language can be complex. 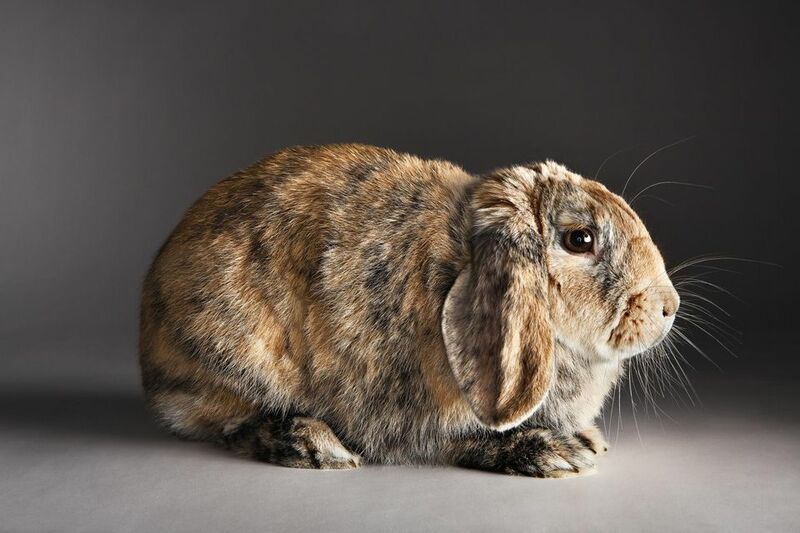 Rabbits communicate much information by how they position and move their bodies, and an experienced owner can learn to read their rabbit's signals quite well. Here are some of the basics. When a rabbit thumps or stomps on the ground with a hind leg, it can make a surprisingly loud noise. This is the way rabbits communicate danger to other rabbits, and sometimes it is a sign of annoyance. Interpretation: "I'm scared and nervous" or "I'm annoyed with you." Gentle, soft grinding of the teeth in a relaxed rabbit communicates contentment (and sounds almost like a cat purring). On the other hand, loud teeth grinding is a sign of pain or discomfort, and your rabbit will often also be tense or hunched up when this occurs. Interpretation: softly grinding teeth: "This is great." You may witness your rabbit rubbing its chin on objects or even people. Rabbits have scent glands on their chins that they use to scent mark territories and objects (the scent is not detectable by people, though, the scent is strictly for rabbit communication). Interpretation: "This is mine!" The binky is the unique and acrobatic jump accompanied by twisting the body or kicking the legs. Rabbits use the binky to communicate that they are feeling very happy and playful. Interpretation: "Life is great! I'm so happy!" A bunny that licks you has fully accepted you and is showing you affection. Interpretation: "I like you." A rabbit that follows you around circling your feet may just be trying to get your attention, but more likely your rabbit is sexually mature and is courting you (especially if accompanied by soft honking or oinking noises). Interpretation: Usually means "I'm in love with you" and means it is time to get bunny spayed or neutered. Sometimes simply means "Here I am, let's play." When a rabbit flattens itself on its belly with its head down and ears held very flat, he or she is frightened and is trying to blend into his or her surroundings. (Note: a relaxed rabbit may also lay flat, but a relaxed rabbit has different body language: relaxed muscles and expression.) Interpretation: "I'm scared!" A content rabbit that is sitting still or grooming may suddenly flop onto its side and lay still. Owners often fear something dire has happened, but it is a sign of utter relaxation. Interpretation: "Oh, I'm just so relaxed." A sudden movement towards you with the head up, tail up, and ears back is a very clear form of rabbit communication: an unmistakable threat. Interpretation: "I don't like that, back off!" Soft Squeal or Whimper: mild annoyance or displeasure. Grunting, Growling, Snorting, and Hissing: all communicate varied stages of anger, stress, or feeling threatened. May be followed with a lunge or bite. Soft Honking or Oinking: communicates sexual interest. If your rabbit is circling you and honking, it is ​time for neutering. Screaming: a sign of extreme pain or fear. Do not ignore; reassure your rabbit and if there is no obvious reason your rabbit might be terrified, take your bunny to a vet. Chinchillas Are the Softest Pet, But Are They Right For You? What Do Chinchillas Like to Play With? Do Cats and Chinchillas Get Along in the Same Household? What Is Chinchilla Fur Slip? What Kind of Food Should Your Chinchilla Be Eating?